The SAM and MGT Logo totally wore off after many times of cleaning. 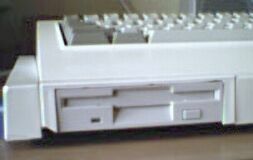 IDE and Power cables come out from the right for a second harddisk or CD-ROM drive. This is what it looks inside. Selfadhesive sticker with serialnumber and power specifications. Originally fitted with screws. 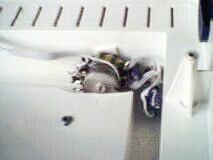 But I removed them so they would no longer damaged my desk. Behind it there is a hole to fit the 256K RAM expansion. 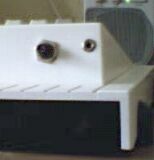 I build a audio amplifier inside the top left corner of the keyboard. In the picture you can see the volume control and headphone socket. 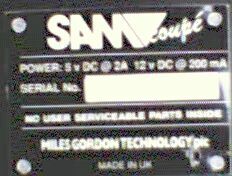 My Original SAM Drive got defect back in 98 and I replaced it with a standard Drive after soldering a new FDC interface and new 12V wireing. 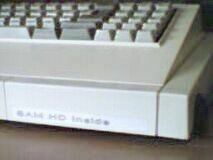 The drive frame was made from the original SAM Drive casing. 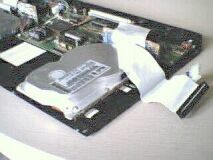 Just like the label says theres a harddisk behind it. 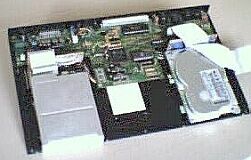 A 3.5" Quantum Trailblazer together with the prototype of the Atom harddisk interface. Looking at the inside you can see the Atom and 3.5" harddisk just fits. 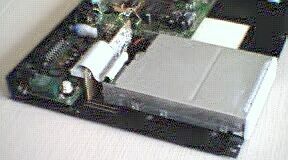 A modified Comms Interface. Besides the standard serial and parallel printer ports I added a EDDAC and DALLAS Clock to it. Pictures were taken with a Polaroid Digital 320 Camera. _Return to index_ _Back to top_Blinky's SAM coupé page (C) Edwin Blink.